3 Beaten-Up Bank Stocks: Are They Bargains? Banco Santander, Capital One Financial, and Huntington Bancshares have all seen their stocks fall significantly this year. But even at these discounts, they may not be smart buys. Banco Santander (NYSE:SAN), Capital One Financial Corp. (NYSE:COF), and Huntington Bancshares (NASDAQ:HBAN) have been absolutely pummeled over the past year. Those sell-offs have driven their valuations into the bargain bin, but that doesn't necessarily make them a buy. To me, a bank stock is a bargain if it trades at a valuation lower than most of its peers, but still provides investors with attractive returns on equity. According to the most recent data available from the FDIC, the average return on equity for U.S. banks was 8.31% as of May 10. With that data point in mind, I reviewed a list of 65 large bank stocks comparing their returns on equity with their valuations relative to to their peers. Through that filter, Banco Santander, Capital One, and Huntington Bancshares immediately jumped off the screen. 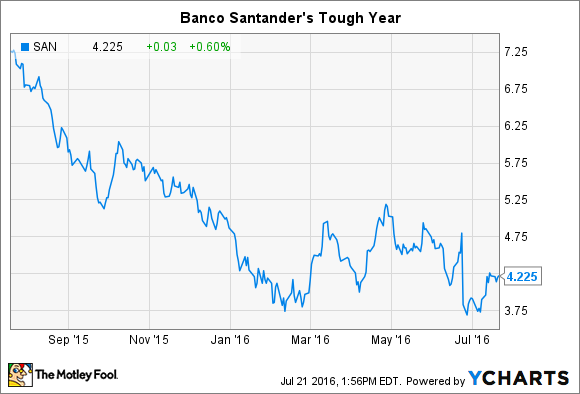 Banco Santander shares are cheap -- no one is arguing that. The stock is down 41.6% over the past year, and off 81% from its all-time, pre-financial crisis high. Its price-to-book-value ratio -- a common metric for bank stock valuation -- is just 0.63. Generally, a bank with a price-to-book-value of less than 1.0 is considered cheap. But is it worth buying? The bank's return on equity is 7.53% on a trailing 12-month basis, which is not great, but not an uncommon level for banks in today's market. Of greater concern to me, however, is the bank's geographic focus and its extremely complex corporate and capital structure. Santander's two most important markets are in two of the most economically challenged regions of the world. Santander is based in Spain, and, naturally, its primary focus is on the Spanish market. Since the great recession, that economy has been one of the weakest in the Eurozone, with problems made worse by lingering softness in its real estate market. Santander's next-largest market is South America, with a focus on Brazil. The IMF projects that the Brazilian economy will shrink 3.8% in the next year as one of the worst economic downturns in the country's history continues. In addition to its European and South American operations, the bank also has a North American business, primarily focused on the U.S. sub-prime auto loan market. That unit is subject to the Federal Reserve's annual stress testing procedures, which Santander has failed in each of the past three years. The failures were not related to the bank's quantitative factors, but rather to qualitative factors like processes, internal controls, and corporate structure. Santander is too complex for the Federal Reserve, and that makes it too complex for me. The bottom line to me is that Banco Santander is definitely cheap, but I think the bank faces too many unknowns to make a good investment. Capital One Financial has also had a tough year, but not as bad as Banco Santander's. Its stock is down 25.8% over the past 12 months, and trades at a price-to-book-value ratio of 0.73. And it's trailing return on equity is 8.34%. 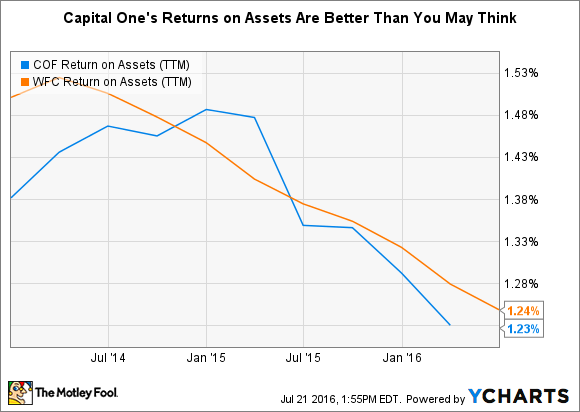 However, Capital One's return on assets is 1.22%, which puts the bank among the best in the industry. The simplified reason for the disparity between its strong ROA and middling ROE is the bank's lower leverage ratios: Capital One's assets to shareholder equity ratio is just 6.9 times. For comparison, Wells Fargo has a leverage ratio of 9.4, an ROA of 1.24%, and ROE of 11.54%. Its higher leverage unlocks more of the bank's strong ROA to boost ROE as well. Unlike the economic headwinds and questionable capital structure at Santander, Capital One's low return on equity is a function of its relatively conservative use of leverage, not weak earnings potential. That's a big difference, and it's why I think Capital One is a bargain worth a closer look. Huntington Bancshares, a $73 billion regional bank headquartered in Columbus, Ohio, has seen shares decline 21% over the past month, with a 17% decline year-to-date. In contrast to both Santander and Capital One, Huntington's returns on equity are actually above those of most other bank stocks. On a trailing 12-month basis, the bank returned 10.26% on its equity. That higher ROE drives the bank's price-to-book-value ratio higher than those of Santander and Capital One. However, even at its 1.15 level today, I think Huntington is a bargain. The ratio was as high as 1.55 times as recently as August of last year. The biggest reason Huntington's stock has declined this year is the in-progress acquisition of another regional bank, FirstMerit (NASDAQ:FMER). The $3.4 billion cash-and-stock purchase should increase Huntington's earnings by about 10% by 2018, but will also dilute its tangible book value by about 12% when the deal closes. Huntington's offer valued FirstMerit at a 32% premium over the stock's value at the time. The average premium paid for the last 10 mid-sized regionals to be acquired was 14%, according to the investment bank Sandler, O'Neill + Partners. It's too early to know if Huntington overpaid, but the market's initial reaction was to punish the stock for both the dilution and premium price. In my view, though, the FirstMerit acquisition was an important strategic move that will both increase the bank's scale and its market share in the Midwest. As long as the bank can continue putting up strong returns on equity, then the stock at this price is a bargain that investors shouldn't ignore.